Contracted tendon implies that the tendon is abnormal when in fact it is the muscle and tendon unit that is short relative to the associated boney structure. The joint capsule may be involved as well. Contracted tendons are most likely the result of poor positioning of the fetus within the amniotic sac or crowding of fetuses within the uterus itself. As the kitten grew in utero there was not enough space for its legs to lay normally. The kitten is cramped. With no room to move its legs, the tendons and ligaments become short and inflexible from remaining in one position. The shortened tendon begins to pull and twist the growing leg out of its normal alignment. The leg is usually turned inward and the affected joint is stiff with a knotty feel to it because the tendons and muscles are all so tight. By the time the kitten is born, it has one or more stiffened legs, often twisted at odd angles with an inability to move or flex properly. Contracted tendons and twisted legs have been documented in most breeds of pedigreed cats as well as mixed breed domestics and colonies of feral cats—so no specific breed is at a greater risk than another breed of producing a kitten with contracted tendons. Kittens born with twisted limbs have been reported in the countries of North America, South America, Europe, Asia and Africa. The condition is worldwide. Contracted tendons have also been reported in domestic animals other than felines including horses, cattle and goats. Zoo animals including African Servals & Tigers have also been known to give birth to newborns with contracted tendons. 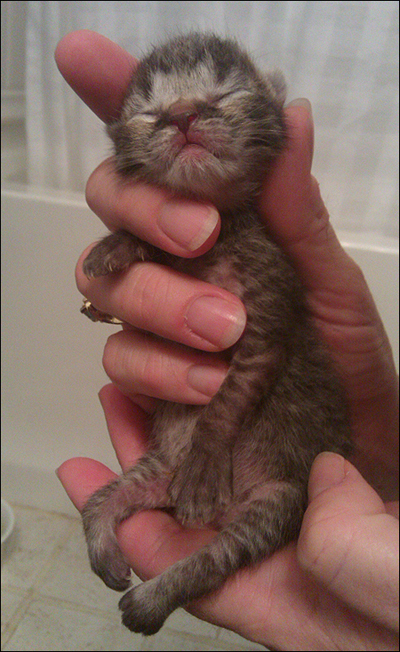 A single kitten may be affected in a litter or more than one kitten may be born with twisted legs. There may be a statistically increased chance of a cat giving birth to a kitten with contracted tendons if the queen has a very large litter or if the queen herself has a small uterus. It should be noted however that twisted kittens have been born in single kitten litters, so litter size is not a reliable predictor. 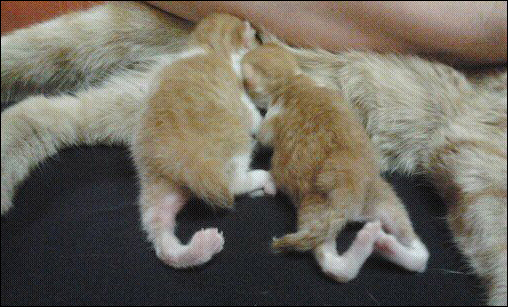 The kitten on the left has one back leg with contracted tendons. The littermate on left has both hind legs twisted. A kitten can be born with one limb affected (unilateral) or two front legs or two hind legs affected (bilateral). When two legs are involved, they may be affected equally or one may be worse than the other. The affected leg may be stiff, or it may turn inward or it can turn AND twist. The degree of twisting of the leg can vary from mild to severe. 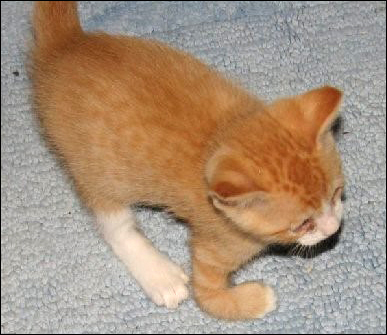 The article Photos Of Kittens Born With Twisted Legs provides examples of the appearance of kittens born with various types of twisted legs. Read the article titled Caring For A Kitten Born With A Twisted Leg for details on how to perform the necessary physiotherapy that involves warming the twisted limb and then stretching and flexing it to help straighten it and increase its mobility. Bracing the leg in between exercises may be necessary in severe cases. If the kitten has been treated from birth and is not improving despite dedicated application of stretching exercises and bracing, you may need to consider possible surgery or having the leg placed in a cast. If an older kitten has received no treatment, it is probably too late for physiotherapy to be 100% effective. Surgery including pinning of the the bones needs to be considered. Most contracted tendons respond to treatment if the condition is recognized and dealt with quickly following the birth of the kitten. The earlier that contracted tendons are treated (ideally at only a few days old), the better the chances of success. The older the kitten is before treatment is first started, the less likely the leg will recover completely. If the kitten has additional problems such as a missing tail, spinal deformity or nerve damage, the twisted legs may improve with treatment but the kitten is less likely to ever be completely normal. Contracted tendons are not genetic. Just because a queen produces a kitten with contracted tendons once, there is no reason to expect it to happen again. If a cat continues to produce kittens with contracted tendons, it may indicate that something else is contributing to the problem besides poor positioning of the fetus in the womb. In such a case, the queen should be removed from the breeding program. Contracted tendons should not be confused with Radial Hypoplasia (RH). RH is a genetic mutation that can appear similar to contracted tendons in a newborn. The characteristics of a kitten afflicted with RH include short forelegs, with a short radius and ulna which may be twisted or absent, extra front toes, and hind legs that are normal length. RH is a permanent condition that cannot be corrected. Diagnosis is confirmed by x-ray.